Weeds are many home gardeners’ biggest enemy. Roundup and other chemicals may seem like the best weapon in the arsenal against weeds. However, many experts discourage the use of chemicals. They can leach into fruits and vegetables. They also runoff and trickle down into groundwater. Moreover, they are more expensive and less effective than many other methods. Ronald Smith of the North Dakota State University Department of Plant Sciences said “weed and seed” combinations in particular are typically weak and practically useless on home gardens and lawns. He reported that a blanket herbicide application cannot reverse a heavy weed infestation in a lawn. “This is not a debatable point. It is something we nailed down here at NDSU years ago in field trials,” Smith stated. Read about 7 strategies for preventing weed growth, and 4 methods of controlling existing weeds, with the advantages and disadvantages of each. The best defense is often a good offense. This means keeping the lawn thick and healthy so that weeds won't have any room to grow. You can also add groundcover and other thick plantings to crowd out weeds in decorative beds. Smith suggested reseeding lawns in the fall to prevent weed growth. Since many weeds are already dead late in the season, there is less competition for space as grass seeds try to take root. Smith also recommended strong, high-quality grass seed. Look for the highest germination and purity percentages available. Once you have put in desirable plants that crowd out weeds, keep your plants healthy with fertile, aerated and well-drained soil. Test your soil and talk to local specialists to create the optimal fertilization plan. Unfortunately, weeds can grow in virtually any soil, but soil improvements will at least create a level playing field with your plants. Soil compaction is a concern under lawns, but can be overcome with core aeration every three or four years, advised Smith. Loosening and turning over the soil is useful for managing weed populations, but tilling should be performed with caution. Tilling may simply rotate weed seeds. However, dormant weed seeds may be brought back to life with tilling. “Seeds buried more than three to four inches deep are much more persistent since there is a lot less biological activity at this depth. The next time the garden is tilled, some of them will be brought to the surface where they can germinate,” according to Hartzler. Carefully hoeing the topsoil can effectively control some weeds but, like tilling, hoeing has its limits. 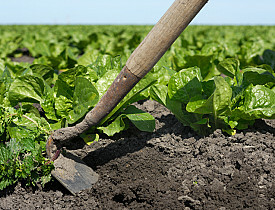 “Hoeing can be very effective for controlling annual weeds. However, perennials often resprout from the roots after the tops are removed,” stated B. Rosie Lerner, extension consumer horticulture specialist at Purdue University. Tom Lanini, professor of plant sciences at the University of California Davis, said mulch is the most important factor in preventing weed growth. Nearly any barrier that blocks light works as a mulch. Bark and other decorative mulches work, but dried leaves, cardboard and newspapers are also effective. “I think organic mulches are definitely the way to go. They have benefits beyond weed control,” Hartzler claimed. Lerner notes that organic mulches improve soil structure, and add nutrients, particularly when used near the end of the growing season. They also keep the soil cool and reduce water loss to evaporation. Straw and hay are among the cheapest mulches, but they must be free of weed seeds to be effective. Like other methods, mulch may be less effective on established perennial weeds. They are better at blocking smaller annual weeds. Landscape fabrics are thin barriers covered with tiny holes. They are typically made of plastic, but may also be sheets of burlap or other natural fibers, or recycled plastics. They are effective at blocking weed growth while allowing water and air into the soil. They should be used in conjunction with thick, effective mulch. “As a garden mulch, fabrics do provide good early-season weed protection. However, because fabrics allow some light to penetrate, weeds will germinate below and break through the cover unless some other material, such as rocks or bark mulch, are placed on top,” Lerner disclosed. According to Dr. Andrew Senesac of the Long Island Research Laboratory, landscape fabric will block many weeds, but it also limits some desirable flower production by restricting the spread of shoots, and inhibits the spread of some groundcovers and other spreading plants. Some particularly hardy weeds and grasses can even germinate with no soil on top of porous weed barriers, then force their roots down. Solid plastic sheets are another alternative for covering the ground and blocking growth of weeds (and other plants). The plastic blocks water and light penetration, killing the plants underneath. At the same time, it traps the sun's radiant energy in the upper 12-18" of soil, a process known as solarization. This is a fast and effective way to kill grass before replacing it with a vegetable garden or different type of lawn. Also, plastic is not a good way to avoid chemicals usage. Lanini notes that most plastic is derived from petroleum, and may be even less organic than chemical sprays. As a chemical-free alternative, though it still uses gas, Lanini recommended torching weeds with small landscape flamers, which are hooked to standard propane tanks. He said this method is quick and effective for ridding weeds in sidewalk cracks and lawn edging. “There is a real satisfaction in turning them to charcoal,” However, he pointed out that flames kill weeds long before the weeds are reduced to ash. He suggested pinching the weed leaf with a thumb and forefinger. If it leaves a fingerprint, the weed is dead. Again, no matter what you do, you will never completely prevent weed growth. However, you can keep unwanted plants from getting deeply established and spreading. Keep an eye on weeds and pull them before they can go to seed. For many species, you have days or weeks of growth before weeds flower and distribute seeds. For example, if you want to get rid of dandelions, pull them before the flowers turn into puffballs and blow around the yard. A single dandelion plant can produce 15,000 seeds each year, and each seed can survive for up to six years in the soil. Though most professors avoid recommend certain products and brands, Lanini swears by the Weed Hound. It allows you to grab and pull out weed roots with a foot lever for quick removal without bending over. He doesn’t mind a few dandelions, but persistently eliminates perennial nuisances. Every two weeks he pulls all his bindweed, an invasive plant that will choke out other plants and take over a yard or lawn. After two weeks, the weed starts sending energy to its roots, so pulling them will starve the roots. Two years of vigilant pre-flower weeding has long-term advantages. “Preventing weeds from going to seed for a few years can deplete the seedbank and minimize efforts in future year,” Hartzler said. Some garden stores sell beneficial insects that can kill weeds or other insects, but they have very limited use in home gardens. Likewise, geese can kill weeds, but many experts don’t recommend setting geese loose on the lawn. Lanini mentioned that geese are natural grass and weed eaters, but require constant babysitting. He suggested homeowners with small orchards might employ a single goose, but other homeowners shouldn’t use them. Hartzler said beneficial insects typically won’t stay in the yard, and can be killed or driven away by mowing and other measures. They may take several years to generate benefits. Herbicides aren’t all made of nasty chemicals. Organic soaps, plant oil blends and even common household products are all used as natural herbicides. Concentrated vinegar is perhaps the most common. Some research suggests vinegar, or acetic acid, is not as effective as some believe. Micheal D. K. Owen, an extension weed management specialist at Iowa State University, pointed out that vinegar does not kill root systems or some larger weeds. However, Lanini said his research shows drenching targeted weeds with vinegar can kill them, without any risk of toxic runoff. It is not selective, meaning it may kill everything it strikes. It also may be dangerous. Avoid eye contact and always follow label directions, even with natural herbicides. None of these methods will work by itself, but some vigilance, regular control of undesirable plants and proper care for desirable plants should minimize weed growth without the need for any chemical controls. Also consider controlling your reaction to weeds. Some homeowners and even experts suggest a live and let live philosophy, so to speak. Lanini agrees. He notes that some grasses are technically weeds, but he doesn’t worry about them. Though he hunts down his perennial bindweed, he lets annual angel bluegrass grow every year. For help with chemical-free weed control, hire an experienced landscaping contractor. Who's the Greenest Floor of All?